Prime Minister Justin Trudeau won't publicly wade into Alberta's unfolding trade war with B.C. over Kinder Morgan's Trans Mountain pipeline expansion. Conservative Leader Andrew Scheer rises during Question Period in the House of Commons on Parliament Hill in Ottawa on Feb. 7, 2018. 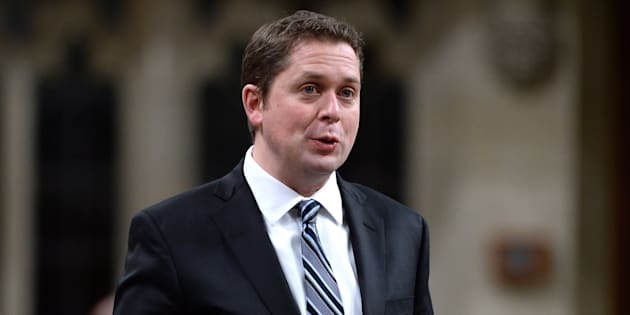 Scheer says that Prime Minister Justin Trudeau doesn't really want the Trans Mountain pipeline expansion to be built. OTTAWA — Just because Prime Minister Justin Trudeau is refusing to wade publicly into the emerging pipeline-induced trade war between British Columbia and Alberta, that doesn't mean things aren't happening out of the public eye, his environment minister suggested Wednesday. Speaking in French after the weekly government caucus meeting, Catherine McKenna said things sometimes happen behind closed doors and that solutions are often more easily found without drama. Maybe so — but when it comes to the Trans Mountain pipeline dispute, the no-drama ship has officially sailed. B.C. threw down the gloves last week when it proposed a regulation to restrict expanded flows of oil through the province without a guarantee spills can be cleaned up — a measure that would effectively halt, if not kill outright, the plan approved by Ottawa in 2016 to triple existing pipeline capacity between Alberta and B.C. Alberta Premier Rachel Notley responded by threatening legal action, cancelling talks to buy electricity from B.C. and then, most recently on Tuesday, banning imports of B.C. wine. Politically, Notley needs the pipeline built to have any hope of re-election next year; B.C. Premier John Horgan campaigned on a promise to kill it off. His minority government's tenuous grip on power depends on keeping the Green party happy — which means Horgan can't back down. Trudeau and the Liberals haven't shown any evidence they've done anything to urge the project along, said Conservative Leader Andrew Scheer. The government said it would not tolerate undue delays, but no one knows what that means or what the government is prepared to do, he noted. Canada's constitution gives Ottawa jurisdiction over interprovincial infrastructure like pipelines, so the federal government has the authority to move things along, said Scheer — but it looks as if Trudeau doesn't actually want that to happen. Trudeau and members of his cabinet have said repeatedly they approved Trans Mountain, they still believe in it and that it will get built. What's unclear is precisely how the government plans to make that happen. "We're continuing to discuss and engage with the B.C. government, with the Alberta government,'' the prime minister said Wednesday before his weekly caucus meeting. "We're making sure we come to the right place that's in the national interest for Canada. Kinder Morgan had to ask the National Energy Board to intervene when the city of Burnaby refused to give permits to start construction on the pipeline and the marine terminal where it ends. The board had to override Burnaby's jurisdiction to grant the permits, saying it was withholding them incorrectly. Kinder Morgan is also awaiting approval on its final route for the pipeline expansion before it can begin construction. Initially, Kinder Morgan hoped the $7.4-billion expansion would be up and running by the end of 2019; last month it revised that to December 2020. The dispute comes just as the federal government prepares to unveil a long-promised overhaul of the environmental assessment process. A protester stands on top of a trailer outside the main gates of Kinder Morgan in Burnaby, B.C. on Jan. 10, 2018. After two years of consultations, focus groups, expert panels and discussion papers, McKenna and an army of other cabinet ministers will fan out across the country Thursday to promote the legislation, which is expected to create a single assessment system for all projects. The hope is to provide clarity for investors and project proponents to know exactly what they'll have to do to get a project approved and how long it will take. There will be no surprises in the legislation, McKenna said. NDP Leader Jagmeet Singh, meanwhile, said the fight over Trans Mountain would not be happening if the Liberals had delivered earlier on their long-promised overhaul. The coming changes help illustrate the difficulty the Liberals have had trying to claim middle ground on the environment and the economy, said Conservative natural resources critic Shannon Stubbs. During question period this week, Carr defended the decision to build Trans Mountain based on a sound review process, followed a few minutes later by McKenna "eviscerating the process'' before she introduces the overhaul legislation, Stubbs noted.